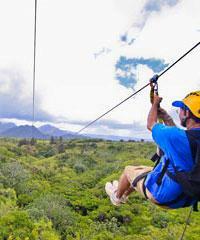 If you are looking for something different or unusual, Kauai has some splendid activity options. Many of these tours cannot be found anywhere else. As you know, the word unique means 'one of a kind'. In all fairness, some of the tours listed on this page would actually be considered more unusual than unique, as there are similar tours (but not many) found elsewhere. But from our perspective this category of tours is so 'special' because the tours found here are so unusual and different. Also, because they are so different, we don't really have a good category of activities to place some of them in unless we put them in a category of their own. Some activities shown here are found in other categories but still qualify as different enough to warrant another mention. 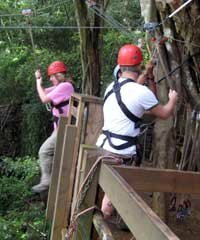 So please peruse these activities and see if any of them can provide a unique experience for you on your Kauai vacation. 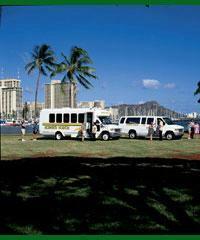 The unique Kauai tours and adventures found on this page will not pick up at the cruise boat pier but these tours can be reached via a Rent-A-Car that can be arranged through Tom Barefoot's Tours and you can be picked up by the Rent-A-Car shuttles right at the cruise ship dock. 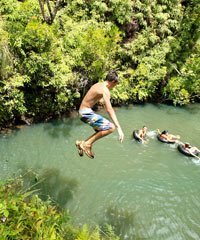 These unique tour offerings are often available on the Thursday and Friday of your Kauai cruise itinerary. 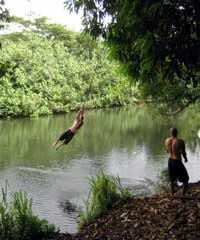 This section that we have is called Unique Tours and Activities on Kauai. We have a number of tours in here that are actually really very, very different but unique is really a word that talks about one of a kind, you can't do anywhere else. There's one particular activity in there that I really wanna explain to you because you won't be able to find it anywhere else, any of the islands or anywhere. It is so fun and so amazing and most people just don't know about it. It's called tubing. What it is, let me explain it this way. I'll show you a map. 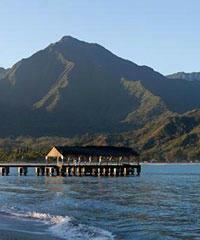 On Kauai, we have the major mountains back here, Mount Waialeale, wettest spot on the planet many years. So lots of rainfall back here and then the rain comes down, it ends up on this really flat surface that's called an alluvial plain. There's rivers and all sorts of things that happened back here but there's a lot of water. On this flat area, in many parts of it in the beginning of last century, the early 1900s, we had a lot of sugarcane happening in here. As you got closer down to where the sugarcane is grown, it got a little bit more arid, a little bit less water, needed to be cultivated. It was a challenge to figure out how to get the water from here, where all it was, to all your sugarcane fields and so on. There was a guy that came around to all the islands in the early 1900s who was this genius at making aqueducts and moving water from one place to another kind of on a gravity flow. He did this on a number of the islands including Kauai, and then actually went to San Francisco and California and he did some more work there, aqueducts and that sort of thing. But what was done here is that in order to transport the water, he devised a series of what ... They were actual flumes. A flume is kind of a tube that is maybe this high and maybe five or six-feet wide, and it's kinda shaped a little bit like this, trapezoidal, and it would carry the water from this area and bring it down, just on a gravity flow, toward the ocean and toward these sugarcane fields. Well, in order to do that, there was a series of obstacles that it had to overcome. It had to go through some mountains, some full-on mountains that needed to be tunneled through. So you'd create a tunnel, which may stand a couple hundred or 300 yards through a mountain. And then when it came out, you'd find yourself in a valley and you still needed to go to the next little mountain range and dig a tunnel through that on your way to the sea, so a trestle had to be built. You go through a series of tunnels that then turn into trestles or bridges, and then turn into tunnels, and then trestles and bridges again, and wind your way all the way down to the coastline. These areas where you come out of a tunnel and now you're in a trestle, and you are surrounded in ... You are in the middle of the jungle. There's nothing around but jungle all around you. And then the water flows along all the way through this beautiful, beautiful terrain. What happened is someone had a really smart idea at one point, because this flume system was there but it really wasn't being used after the sugarcane fields were disbanded or were on their way out. So we've got this flume system but it really wasn't being used for the purpose that was intended. Someone came up with a great idea to go ahead and do this little tour using this flume system. What it involves is meeting a group of people, maybe 12 people or something like that, putting them in a van and then driving back up to an area or a reservoir, which was where the water flowed from. And then everyone was issued this big, kind of an inner tube, like an inner tube in a car but big, oversized and beautiful colors and so on. You get one and then you jump in the inner tube and your legs kinda hanging over the side, and they get everybody together, kind of a big group, and then say, "Okay, follow me. Let's go." One after another, or one or two at a time, all take off and then you kinda cruise in this real gentle-flowing water that's just barely gravity-flowing in the direction toward the ocean but enough to get you going maybe a couple miles an hour. 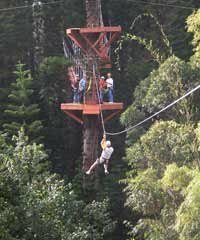 You cruise like little bumper cars, really, right through these flumes, through the caves, out on the trestles, through this forest, and all the time you're laughing out loud as loud as you can. You're bumping into people. The water itself is invigorating 'because it's cool, and it's such a different experience. You're in dark caves, you're out on giant trestles looking down, and you're just having the best time of your life. It's impossible to do this tour and not have a great time. It just takes adults and turns them into children instantly. People finish this, they've had such giant belly laughs, they just love this entire trip, and come back and do it again the next time they're here. 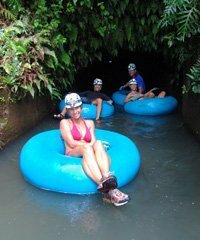 It is a wonderful, wonderful tour, this tubing on Kauai. I would highly recommend that you let us organize this for you. 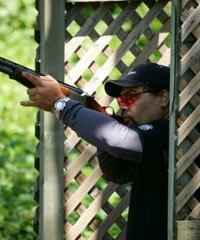 One of the big problems we have with it is that it is so much fun and so popular, that it's hard to get people on. And so we're disappointing people all the time when they're calling and asking for us to arrange a tour for them, we can't do it because they call too late. So this is something that you should do while you're still on the Mainland or wherever you are and you know you're coming, and set aside the right day that you wanna do this. Let us know what the timing is for it, and you won't be disappointed. You will have a great day. This is a great for the entire family, for everyone to have fun on. It is a really, really good one. 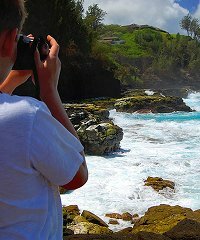 If you have any questions about Tours or Activities in Hawaii, just give us a call or check out tombarefoot.com. We're here to help.